Friends, family and clients have asked me over the years where I predict interest rates will go. Currently the world economy has a very large problem and that is DEBT. To combat debt central banks have been trying to generate inflation. Their hope is that with lowered interest rates and quantitative easing, the debt the average Canadian and the Government hold will not be as big a problem for our economy. Unfortunately the opposite has been happening and over the years we have observed incredibly weak inflation. In some quarters even deflation! Today I am going to talk about how interest rates affect you, as well as give our prediction that low interest rates are here to stay. Central Banks exist to regulate a nation’s money supply and economy. One of the main monetary tools Central Banks have is the ability to set interest rates. Interest rates are very important because they affect the rate at which you can borrow money. That includes loans, credit cards and mortgages. Imagine if the cost of your mortgage were to increase, suddenly you may find yourself unable to afford your home. This can even affect the value of your property itself. It is thus easy to see just how powerful interest rates can be and how drastically they can change the economy. We are now starting to see a recovery in the Canadian economy from the energy crisis of last year where falling oil prices caused the Canadian dollar to lose a lot of value against the American dollar. As the cost of oil has been increasing, the Canadian economy has been starting to heat up. When the economy heats up, generally interest rates go up as well in order to keep the economy from running too hot. With household and government debt being at record highs, combined with low inflation, our prediction is that there is no way interest rates will not go up more than half a point over the next two years. Simply due to the large amount of debt carried by Canadians, any large increase in interest rates could trigger a recession. 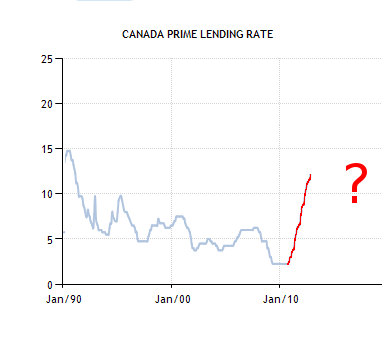 If the interest rates went up by even 3% over the next 5 years, it would be a disaster causing the largest recession in Canadian history. Canada could not afford this. The amount of debt the average Canadian has, is an astonishing almost $22,000. That is not including mortgages! The Canadian Federal Government is no better, with $632 Billion and counting in debt. If this is the case why do we still talk about how we are “due” for interest rate increases. It has a lot to do with history and the often cyclical looking nature of markets. We often look to the past to predict what will happen in the future. Often this gives us a great sense of inevitability. For instance, between 1936 and 1956 a period of 20 years, the interest rate was 2%. This 20 years was followed by period of tremendous fluctuations in rates as well as rampant inflation. Trying to predict interest rates has become something of an industry just like predicting where property prices will go. There is a lot of noise, and a lot of scare tactics have been deployed by banks. Banks want to get the most money for their services. Banks have an interest in pushing the narrative that interest rates are about to go up so they can lock you into a “safe” fixed interest rate. This rate is higher than the current set interest rate. Given that we are in a similar period of historic low interest rates, it is easy to see how many of us are absolutely sure that interest rates will do the same in the near future. Thankfully we did our research and we kept our assets in variable mortgages which have compounded to tremendous amounts of savings. If we had locked into a higher rate fixed mortgage we would have paid thousands more over the last few years. So what can you do? Consider, if you can borrow a million dollars at 3% and invest in something that earned 15% if you only needed to put in some work to ensure stability, wouldn’t you? I don’t mean that you should borrow beyond your capacity to pay back. I do think that borrowing in something that provides a passive income that can cover debt payments as well as generate profit can be a great way to preserve the value of your wealth as well as generate income. Just be sure that your investment can handle price swings. One way to know if your assets can handle price swings is to stress test them. See what would happen if interest rates were to shoot up suddenly, maybe 3% or even 5%. How much does that change your monthly expenses and are you still able to operate a property profitably? There is no real easy way to do this other than getting out your pencil and calculator! While interest rates are at a historically low level, due to the factors mentioned above, we believe that low-interest rates are here to stay for some time. The large debt issue within the global economy shows no signs of slowing. So long as it is an investment you can afford and have planned, there’s no reason to not borrow money.